Welcome to the October series of Manners Monday where we’ll hone our table manners in preparation for hosting and being hosted at numerous holiday gatherings for the next two months. And while I’m sure I’ll reference her many times, I’d be remiss if I didn’t go ahead and mention in advance my mom. Everything that I know and love related to entertaining is straight from her heart – as she is the quintessential hostess. So, thanks Mom. This is for you. As Maria said in The Sound of Music, “Let’s start at the very beginning.” So, today we’ll focus on setting the table – which is an excellent lesson, not only for the ones who are setting it, but also for those who are eating from it! We all remember the scene from Pretty Woman where Julia Roberts is trying to figure out what to do with all that is before her, so today’s lesson is for anyone who has felt even slightly uncomfortable at a formally set table. The first thing I’d like to point out about the rules of setting a table, is that like other social mores, they are there to help the meal progress with ease and comfort. 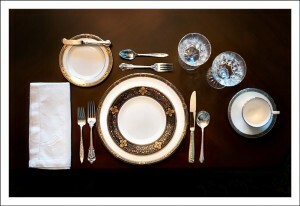 The picture here shows a place setting for a traditional formal American dinner. Dinner plate in the middle with the salad plate on top. (I’m not showing a soup bowl, but if I were, it would be on top of the salad plate.) Dinnerware and utensils are set to correspond with the order that the courses are served: soup (soup spoon is to the right of the dinner knife), salad (salad fork is to the left of the dinner fork), and finally the main course (dinner fork to left of dinner plate and dinner knife to the right). Dinnerware is used from top down; utensils are used from outside first moving in closer to the plate. So, if you are ever in doubt as to which utensil to use, choose the one furthest out. Note that the serrated edge of the knife points in – toward the plate. As a hostess, you’d be appalled if your guest cut his finger on the knife when picking up his spoon, right? So serrated edge points in. The napkin can go several places: to the left of the forks (as shown), with a napkin ring and atop the dinnerware, or – if you really want to experiment with style – in one of the beverage glasses. When it is placed as shown, the fold of the napkin should be on the right – inside toward the plate. This is so that the guest can lift the top layer of the outside lower corner of the napkin, and it falls to unfold itself. And, it goes into your lap as soon as you sit down. Above the forks is the bread and butter plate with the bread and butter knife. The dual beverage glasses shown are for ice water (inside) and wine (outside, as it may be exchanged white for red if the hostess is serving a different wine for each course). Coffee or tea cup and saucer to the right of the table setting. The utensils at the top of the plate are for the dessert course. 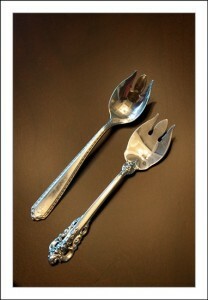 And despite popular belief, they are not so that you have your choice of spoon or fork for dessert! The spoon is actually a coffee/tea spoon for those who will take sugar or cream in their coffee or tea. The utensil closest to the dinner plate is the one that the hostess expects you to eat dessert with. Rule of thumb for hostesses: if dessert is served in a bowl, it should be eaten with a spoon; if it is served on a plate, it should be eaten with a fork. Think about it – it does make sense. So now I hear, “But what if I’m serving my grandmother’s apple pie recipe with ice cream?! What then?” Ah. Then you have the wonderful opportunity to use my favorite eating utensil – the ice cream fork. One particular fast-food chain has cheapened the sincere practicality of this piece by calling it a “spork” but it really does exist. And, it is the perfect tool for eating pie with ice cream. A couple of other general notes about a table setting. The bottom of the dinner plate and the utensils alongside it should line up and sit about an inch from the table edge. Also, only set the table with the pieces that your guests will use at the table. (For example, plan to retire to the den for dessert? Don’t include those pieces at the table.) So a less formal dinner may only necessitate a dinner fork, plate, knife, glass and napkin. There is nothing wrong with that, but don’t let informality trump the opportunity to set a table properly. Finally, a note about your silverware. Don’t be afraid of mixing and matching. I’ve used five different patterns here – not because I have five sets of silver, but over the years, I’ve collected odd pieces from here and there. In this place setting there are pieces that represent both my side and my husband’s side of the family, as well as friends and places I’ve been. Mixing your silver, beverage stems and dinnerware at the table provides easy and interesting table conversation. It is also fun – and more economical – to scour antique shops for odd and interesting pieces. Now you’re ready to set a table – or enjoy it – in style! Cheers!